The whales are a nightmare. 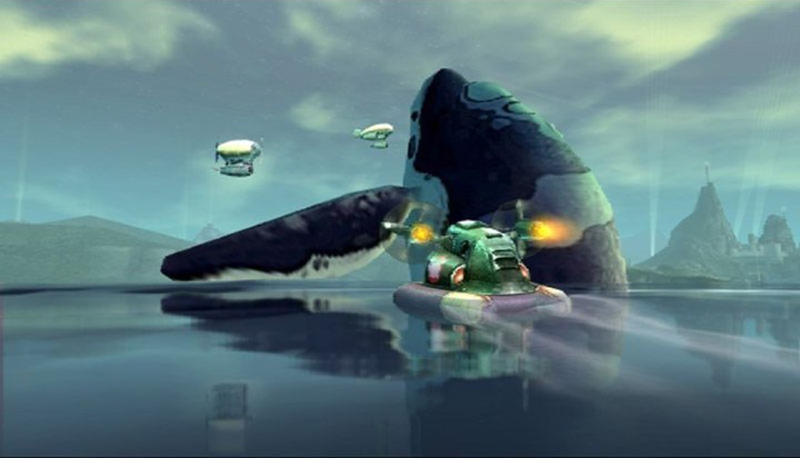 Beyond Good & Evil is home to all manner of alien flora and fauna, but it’s only the whales that I find deeply upsetting. The scale of the beasts, the way their lazy flippers wave about on the periphery of their bulk, the ease with which something so huge breaks the surface of the water and then disappears without a trace. It sends a shiver down my spine every time. Somehow, the creepiest thing about these deep sea monsters is their infuriating passiveness. They’re just animals doing pre-programmed animal things. Whales in BG&E aren’t hostile enemies or friendly quest-givers; if it weren’t for a small required entry in the wildlife codex they’d be nothing more than part of the beautiful diorama of Hillys. Why are they so calm? What are they hiding? Why does going even moderately close to these fake sea creatures make my brain twitch? Eventually I managed to suppress the discomfort and mild terror long enough to properly wonder what was going on here. This wasn’t limited to those damn whales, I realised; it applied to every seemingly-innocuous yet dramatically oversized video game creature. 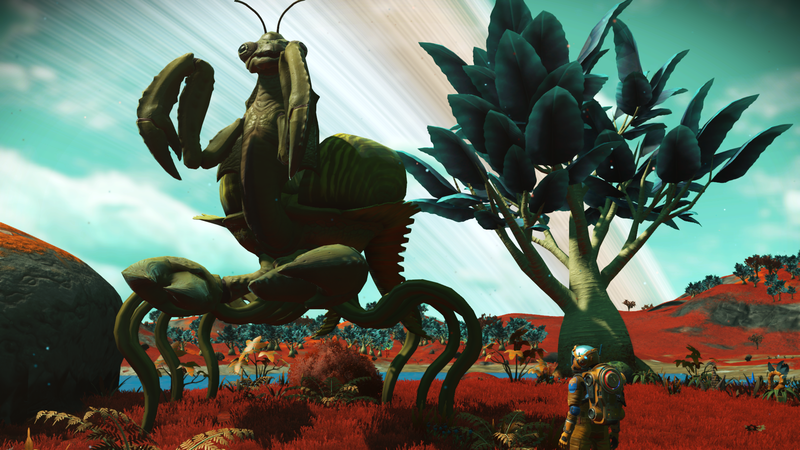 Morrowind’s grotesque public transportation system, the silt striders; the gatekeeping Wardens of Darksiders; Horizon Zero Dawn’s lazily circling Tallnecks; whatever Cronenberg nightmares No Man’s Sky‘s madcap procedural animal generator wants to throw in my face on a given afternoon. Anything really big and functionally inert sends the skin crawling. My best ongoing theory is that they should not exist. Decades of experience with video games has taught us as players that if something is large and moving around, it’s the enemy. In fact, the larger a creature is, the more likely it is to be some sort of boss or legendary bad guy only to be messed with by those with the skill and dedication to reach level 99. Tellingly, a quick keyword search for largest creatures in games will net you an endless supply of listicles about the top 10 biggest or scariest bosses, but very little else; passive creatures aren’t real, except when they are, except when they loom into vision and your muscle memory collides with your intellect, your brain feeding you fear responses while it also tells you there’s nothing to be worried about. There is a palpable sense of dread that accompanies my approach to the aforementioned whales; a tense complicity not unlike the feeling of walking further down the corridor in P.T. while knowing that is, in fact, a terrible idea. And, just like those horror games, the real fear comes from the fact that you’re choosing to move forward, even though you hate everything about it. It’s your fault. The ultimate expression of this type of lizard-brain failure is in Shadow of the Colossus, a game about nothing but gigantic creatures. Your mission is explicitly to murder the lumbering beasts without stopping to consider anything at all, but their passive nature (along with other subtle clues) begins to gnaw at you the further into the game you get. And over time, you get it: they’re in the wrong place, they don’t play the role you thought they did. It’s unsettling. It wasn’t just one video game that tricked you, it was all of them. An interesting aspect of this journey through my own irrational fears is noticing how effectively the medium of games allows me to step through it. While I can watch a scary movie and absolutely soil myself seeing a hollow-eyed ghost or faceless nightmare shadow, there’s very rarely any impetus to explore the whys and wherefores of negative reactions. You get scared, you move on. There’s also less capacity to simply have unexpected emotional, physical or mental responses to this or that in a controlled experience like film, TV or books. Generally speaking, you react to what the creator wanted you to. In contrast, even the most directed video game has elements of emergent play, unanticipated interaction, player experiences that are unique to individuals; every session is, in a sense, an experiment, with a collection of variables and tools to test out. It’s very unlikely that the developers of Beyond Good & Evil’s wildlife system were trying to upset me when they designed their space whales. But the combined elements—whales being large creatures, peaceful wildlife, a photography system that requires you to be moderately close to animals—create a situation where the fear emerges. Then that same environment provides the space for an examination of that fear. The existence of big bosses in the game, for example, prompts a thought about what separates the terrifying whales from the humdrum monsters, and the more you begin to think about what chemical reactions are being set off between the virtual world and my own internal reality. Their interactive and reactive nature puts games in a unique position, not just to find things that scare us, or make us uncomfortable, or cause sadness, but to provide therapeutic tools for facing and understanding those feelings. Finding part of a game which challenges you in a more figurative sense can be instructive, and finding a way to overcome that challenge can be a positive experience. Even more so if the feelings come from an unexpected place, like a whale; the process of working out exactly why something seemingly so innocuous provokes such a strong reaction can be an interesting journey all on its own. It’s like a mystery written by you, about yourself, which you left on a table for you to find before giving yourself amnesia. The next time something truly upsets and confuses you in a video game, consider it a challenge. Why does it scare, anger or otherwise trouble you? Is it supposed to? Are there any aspects of the game that are similar but mysteriously fail to have any effect? Use fear the way we used it tens of thousands of years ago: to better equip yourself for survival in a tough, frustrating world where nothing makes sense and sometimes there are giant whales.